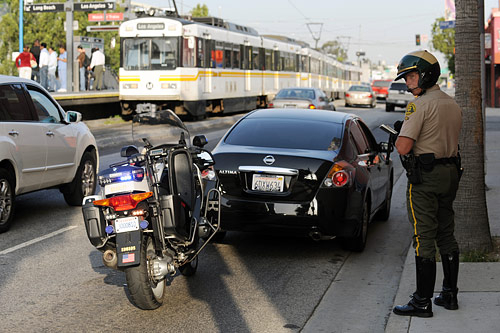 Officers from the Los Angeles Sheriff's Department and the Los Angeles Police Department spent Wednesday morning writing citations to motorists and pedestrians who ignored safety warnings near the Blue Line in downtown L.A. Photo by Juan Ocampo. If you are now in possession of a citation for violating traffic and pedestrian laws around the Blue Line, don’t complain — you weren’t warned! As we posted last week on The Source in our series on Blue Line safety, there would soon be a sweep of the line by police. Well, that sweep occurred this morning, with dozens of officers from the Los Angeles Sheriff’s Department and the Los Angeles Police Department writing 295 tickets for violations in downtown Los Angeles. Among those were four tickets issued to motorists for running a red light, 113 to pedestrians for jaywalking and 62 to motorists for holding a cell phone while driving. Thirty-four vehicles were also towed for various offenses.